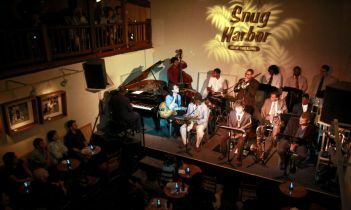 It's a tight squeeze on Wednesday nights when the Uptown Jazz Orchestra takes the stage at Snug Harbor, but director/co-founder Delfeayo Marsalis doesn't mind. "Whatever you have to do," the trombonist says philosophically. After a consideration, he adds. "Squished up is actually better because you can hear what guys are playing. A lot of time, if you're in a situation when you're spread apart you don't really feel the vibration of the music that well."